NETWORK UPDATE: THE GOLDEN GLOBES adjusted to 5.5 in final numbers (0.3 below the finals for last year’s edition), and the ARRIVALS SHOW fell to 1.4. After adjustment for the NFL WILD CARD game that ran into FOX primetime, THE SIMPSONS adjusted to a still-tremendous 3.6, COOPER BARRETT’S GUIDE TO SURVIVING LIFE got a solid sampling at 2.1, FAMILY GUY was at 1.8, and BORDERTOWN was at 1.5. The only other network adjustment was a 0.1 bump for THE GOOD WIFE. CABLE HIGHLIGHTS: Bravo once again led Sunday cable, with REAL HOUSEWIVES OF ATLANTA up 0.03 to 1.41, although lead-0ut WORK OUT NY didn’t hold much of that at 0.38. On E!, KEEPING UP WITH THE KARDASHIANS dropped 0.24 to 0.99, after a 0.59 lead-in from the GOLDEN GLOBES ARRIVALS SHOW, but lead-out THE ROYALS gained a tick to 0.38. (Afternoon and late-night GLOBE-related programming were both at 0.21.) Discovery’s ALASKA: THE LAST FRONTIER gained 0.13 to 0.89. Adult Swim’s ROBOT CHICKEN climbed a tenth to 0.72, and MIKE TYSON MYSTERIES edged up 0.04 to 0.61. On Food Network, WORST COOKS jumped 0.15 to 0.70, GUY’S GROCERY GAMES was up a tenth to 0.52, and CUTTHROAT KITCHEN rose 0.12 to 0.47. 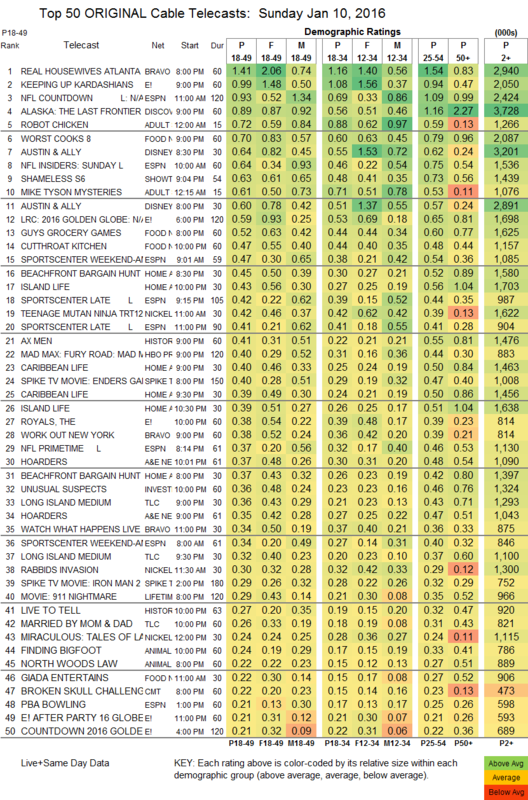 Disney Channel’s AUSTIN & ALLY hit the Top 10 at 0.64 for its 8:30PM episode, with 0.60 for the 8PM half-hour. SHAMELESS returned to Showtime (without any HBO competition) at 0.63, down 0.17 from its 2015 premiere. History’s AX MEN ticked up to 0.41. A&E aired 2 episodes of HOARDERS at 0.37/0.35, compared to last week’s 0.48/0.45. 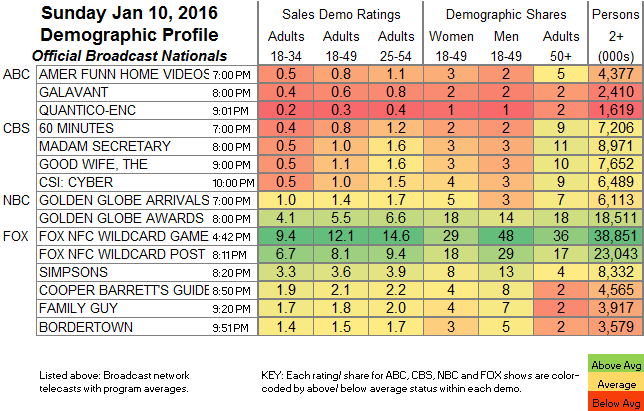 TLC’s LONG ISLAND MEDIUM plunged to 0.36/0.32 after last week’s 0.59, and MARRIED BY MOM & DAD dropped 0.11 to 0.26.